Allergic rhinitis is commonly known as Hay fever, caused by some of the typical allergens namely pollen, grass, dust, animal dander, cat saliva and mold. Apart from this common allergens, some of the other major factors responsible for the disease are cigarette smoke, chemicals, cold temperatures, humidity, wind, air pollution, hairspray, perfumes & colognes, wood smoke, and fumes. This is the most common allergic disease found in majority of the countries with a prevalence range of between 2 to 40% in various countries across the globe. Allergic rhinitis refers to a chronic inflammatory disease affecting the nasal cavity identified by some of the common symptoms such as Nasal itching, sore throat, runny or blocked nose, and sneezing are some of the characteristic symptoms of allergic rhinitis. Globally demand for allergic rhinitis treatment market is driven by factors such as increasing awareness amongst people about disease and increasing number of respiratory problems related cases due to increasing pollution and tobacco consumption. This report identifies the allergic rhinitis treatment market size in for the year 2014-2016, and forecast of the same for year 2021. 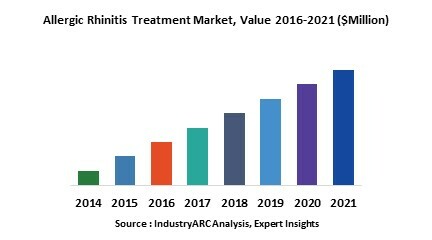 It also highlights the potential growth opportunities in the coming years, while also reviewing the market drivers, restraints, growth indicators, challenges, market dynamics, competitive landscape, and other key aspects with respect to allergic rhinitis treatment market. Globally demand for allergic rhinitis treatment is expected to witness growth in the upcoming future due to increasing respiratory disease globally. North America represents the highest market share in the global allergic rhinitis treatment market as reported cases for allergic rhinitis is highest in the U.S. followed by Europe with the second highest market share amongst all the major regions.